Clinic Synopsis: A combination of live demonstrations, visual aids, audience participation, and bad jokes keep the crowd engaged as I demonstrate how to survive the most common woodwind repair problems a band director might encounter minutes before the young musicians take the stage. Clinician Biographical Information Miles DeCastro is the instrument repair technician at The Crane School of Music, State University of New York at Potsdam, where he teaches courses in instrument repair for educators, and is responsible for the repairs, maintenance, and inventory of over 1,000 instruments. Prior to joining Crane in July of 2016, he was the general manager at Bridgepoint Music in Menlo Park, CA since 2012, and was a repair technician at Maytan Music Center in Reno, NV from 2008-2011. Miles has been an active member of the National Association of Professional Band Instrument Repair Technicians since 2007. In that time, he has attended every national conference and presented at the past four national conferences in a row. He is currently the Vice President and director of Region 1, has served on the finance committee, and has hosted clinics at the regional and national level. On top of all of this, Miles is a Straubinger Certified Technician, Yamaha Certified Sales Professional, graduate of the Yamaha Service Advantage Program, and he has studied instrument repair with Morrie Backun. All of these experiences helped him lead Bridgepoint Music to being a NAMM Top 100 Dealer four years in a row. Prior to becoming a professional repair technician, Miles graduated with honors from Mansfield University with a degree in music education, was a middle school band director in the Baltimore City Public Schools, and received his Certificate of Band Instrument Repair Technology from Renton Technical College, graduating with a 4.0 GPA in 2008. 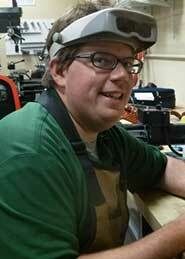 Miles is the owner of North Country Winds, a repair shop specializing in professional clarinet repair.